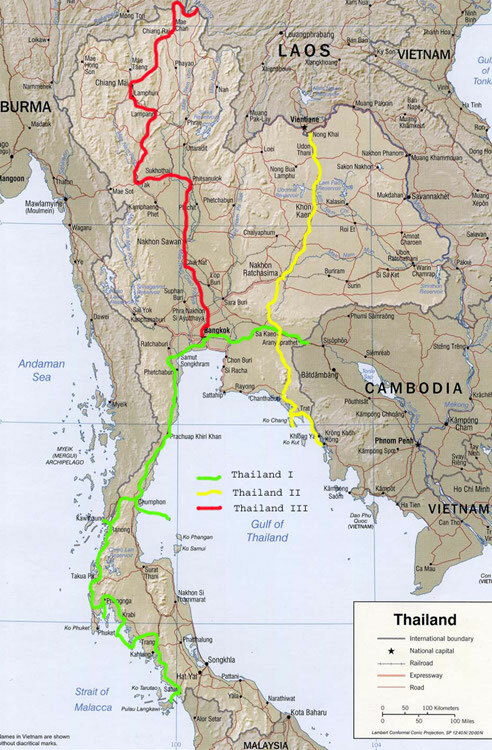 314 km of cycling - as part of a bicycle world trip - from the Cambodian border along the coast to Ko Chang Island, northwards to Chanthaburi, from there by bus to Udon Thani and by bike to the Lao border. Do you like Cycling Thailand II? It went first to Trat and then the next day by ferry to Ko Chang. For Christmas Eve Steffi and I wanted to spend the beach! Quite steep coastal roads led us to take a bungalow on one of the first beaches and to treat ourselves to exploring the island the next day a moped, it was finally Christmas! With that we drove almost once around the island. And, who would have thought, after more than 7,000 kilometers of bike with only a single plate, I managed the second with the scooter after a few kilometers ... On Christmas Eve, I then made time on thick travel funds and we dine royally in an Italian pizzeria. But that's not all, at a beach bar on White Sand Beach, we treated ourselves to a few more cocktails. It was very nice here! With a heavy heart, we saddled up again on Christmas Day and made our way north, because we both wanted to be in Laos on New Year's Eve. So we cycled to Chanthaburi and then shortened, for me for the first time on this trip, a piece of the bus. 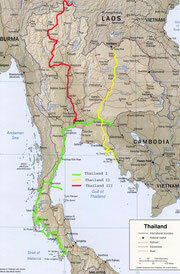 The route from Chanthaburi via Korat to Udon Thani would have been more of a monotonous kilometer ride on a four-lane highway over flat land anyway and it would have been unlikely to see much to the right and left of the track. In Udon Thani I ran the next morning directly to the main post office, where as expected two thick envelopes from Germany were waiting for me. Besides some gear, I was surprised with a music CD and Christmas and birthday greetings! Three days before New Year's Eve, we cycled the last bit north to the nice Thai border town of Nong Khai and quartered ourselves in an inn right on the banks of the Mekong, which we had only left in Cambodia's capital Phnom Penh. We spent a nice day at the Sala Kaew Ku Sculpture Park before heading to Laos the next morning via the Thai Lao Friendship Bridge.